It’s that time of the year: Tax Time. By now, employers have sent out W-2s, schools and lenders have released other important tax forms, and the IRS has started accepting tax returns. However, for many people, thinking about tax season should have started well before the first of the year. We are now well into February, so your 2015 books should be closed and on their way to your CPA. 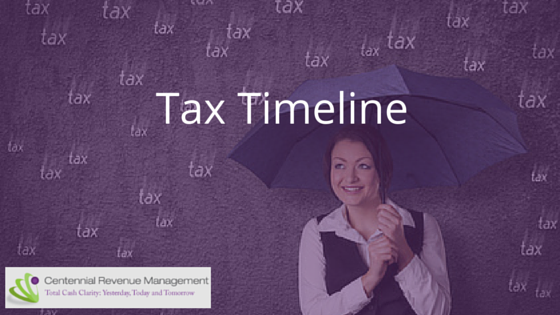 If you are filing a corporate return, your filing is due by March 15th. If you haven’t sent your information over to your CPA to begin the tax preparation for your company’s return, you need to get BUSY! You should have everything you need to close your business books by now. If your bookkeeper hasn’t been proactive in getting your 2015 books reconciled and closed, WHY NOT? If your CPA is used to filing an automatic extension, I would be curious as to WHY? Is it because you are always late? Or is it because it’s “the way it’s always been”? The sooner you can get your corporate return filed, the sooner you can get your personal return filed. Remember, your business doesn’t pay taxes; they flow through to you personally. Also, if you are going to file an extension for your return and you are going to owe money; this will impact your cash flow down the line and you may have to pay penalties. If your business generated a profit, wouldn’t it be good to know sooner rather than later what your tax liability is going to be, so you can plan and be proactive on where the money is going to come from to pay those 2015 taxes? For my clients, we have already gone to the CPA prior to the closing of 2015, and done a year-end projection. My clients already know what their personal tax liability is projected to be for their payment in April. If you do a Cash Flow Forecast, you will already have eyes on the outstanding liability for April and will be well into the planning (and saving) phase of cash on hand. Once your CPA finishes the return, I recommend that you schedule, at minimum, a phone call to review the tax return against your financials. The reason for this, is for you to plug in to your financials and educate yourself on learning something new that affects your business which you may not have understood in the past. It’s also an opportunity to learn more about whether you should be planning to do quarterly tax estimates for 2016 so you can be PROACATIVE in planning how to reserve your cash on hand. Some key questions you might ask your CPA, are to explain how the OWNER’S DISTRIBUTIONS will flow through to your personal return? What is the difference from a tax perspective of Owner’s W2 Wages versus Owner’s Distributions? What is the tax basis that you need to understand so as not to “flag” the IRS for a potential audit? When you complete the filing of your personal return again, I suggest planning, at minimum, a telephone call with your CPA. Now it’s time to understand how your business NET PROFIT/NET LOSS and OWNER’s DISTRIBUTIONS flowed through to your personal return. Also, it’s another opportunity to revisit how you might be splitting W2 Wages with Owner’s Distributions for 2016. Once your returns are filed, it’s time to begin planning for 2016. Yes, it’s only April on this timeline, but it’s a good time to be PROACTIVE and create strategies on how to reduce your taxes for 2016 and get more money into your pockets! I recommend, setting a mid-year meeting with your CPA after June to check in and see how your business is trending. I also recommend you talk with a wealth manager to get input on 401K, simple IRA’s, and captive insurance plans which are targeted to either reinvest in your employees by offering more benefits and/or adding a business deduction that will defer more money to your retirement. The earlier you can get a strategy in place, the quicker it will help you to execute alongside your existing cash flow and plan for 2016 year-end tax deductions (instead of scrambling in December looking for tax deductions)! I would also recommend that you have a 4th quarter check-in with your CPA. You want to see how your business is trending for profit (or losses) and if you need to make any payroll adjustments regarding allocating distributions to W2 Wages. The purpose of this is to plan ahead for cash requirements if you need to pay payroll taxes on additional W2 Wages should you decide to readjust distributions in the 4thquarter. For me, the Dirty Little Secret about Tax Planning and Cash Flow is, that if you don’t know what your taxes are likely to be by this time in February, then you did not plan effectively last year to help minimize the impact that your taxes are likely to have on your current cash flow! I know this is a lot, but his is how I would be looking at Taxes and the Impact it will have on your CASH FLOW.